This picture is realy stunning! Thanks to sharring this whit us. Beautiful picture. It holds so much mystery. I especially love the table the little gems are sitting upon! I've been wanting a cloche for a while now, but maybe I should also have my eyes peeled for a cool dome! However, I will like the clear glass for my purposes. Neat post... I like that grouping. Donna, what a lovely vignette. All of the elements work so well together! I dream of domes like the old silver one on the right. Yum! I don't even have words for how utterly beautiful this image is...every single detail is lovely...if it was in my home I'd stare at it all day. 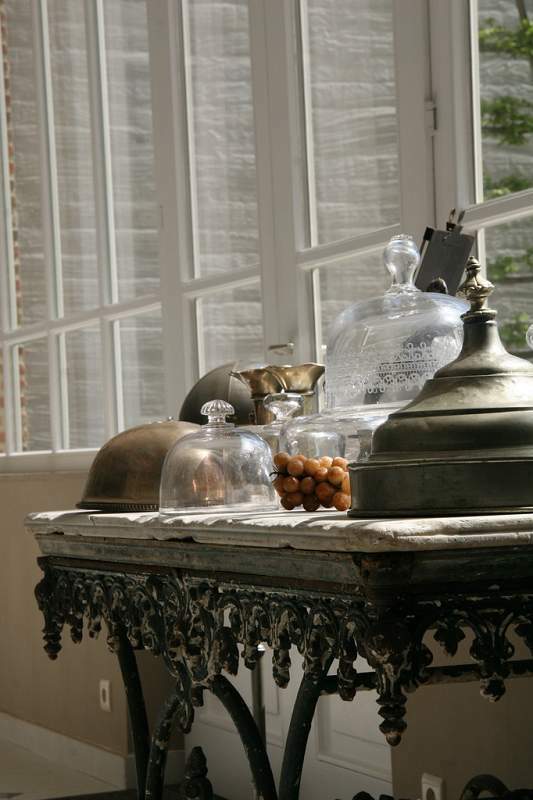 Look at those windows...and the marble, it's so perfectly worn...that was a much loved and used table. All stunning. And very you! I just love the bistro bakery table, and the collection of cloches is so perfect on it. You always bring us the best! Domes and meat covers are special. They fit into that rare catagory of kitchenalia, being both beautiful and useful. Well, that's my excuse when I bring home yet another one. Your photograph shows such a beautiful collection and I just love the marble-topped table. Very nice Donna. I love how 'quiet' the picture is. Beauty needs no voice. Love old domes and cloches. The table is incredible too! I would love to own an antique silver dome...so over the top elegant!